CAPE CANAVERAL, Florida - Space shuttle Discovery decamped from the international space station Saturday to begin a return trip back to Earth. Pilot Mark Kelly fired up steering jets, slowly backed Discovery up and then put it on a path away from the space station as they passed over the Pacific Ocean more than 220 miles (355 kilometers) below. Two hours earlier, Discovery's six astronauts snapped last-minute photos and bid farewell to the space station's crew before closing a hatch for departure. They left behind former crew mate Thomas Reiter of the European Space Agency, who came up in Discovery for a six-month stay at the station with Russian commander Pavel Vinogradov and U.S. flight engineer Jeff Williams. "Have a safe journey back, soft landing and we'll see you on the ground in a few months," Williams radioed Discovery as it backed away. About 45 miles (70 kilometers) from the space station, the Discovery astronauts planned to begin a final inspection of the shuttle's right wing and nose cap - the fourth examination of the shuttle using a robotic arm and boom during the 13-day mission. The shuttle stayed close enough to the space station to dock again if necessary until it was cleared to return to Earth by mission managers reviewing downlinked inspection images. The mission, scheduled to end with a landing Monday at the Kennedy Space Center, has been viewed as a genuine success by NASA managers. The shuttle launched without any apparent damage to Discovery's thermal protection system - avoiding the problem that doomed Columbia's seven astronauts in 2003. 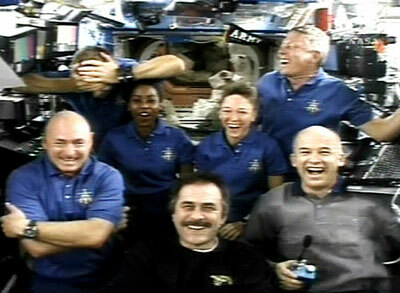 The transfer of supplies and cargo between the shuttle and station was done much faster than expected. Space-walking astronauts repaired a crucial rail car on the space station and were able to show that a 50-foot (15-meter) boom attached to a 50-foot (15-meter) robotic arm could be used as a platform to make repairs to the shuttle.Discovery's crew members set an unofficial record for use of robotics in space, and they delivered Reiter to the space station, raising the number of crew members to three for the first time since the Columbia disaster. There remained only one concern that could affect the astronauts' planned landing at the Kennedy Space Center - a slow leak in one of the shuttle's three units that power hydraulic systems used for steering and braking. It could be leaking harmless nitrogen or flammable hydrazine fuel, but there is no way of knowing that, so NASA is treating the problem as if the leak were fuel.To be on the safe side, NASA will turn on the power unit with the leak early Sunday as part of its normal testing and then see if the leak rate changes. If it does, NASA may burn off the hydrazine and shut down the power unit before the shuttle returns to Earth to eliminate any fire hazard, said John Shannon, the shuttle program's deputy manager. If that happens, the shuttle would land with just its two other power units for the first time in the spacecraft's history. The shuttle needs only one power unit to land.